Most glorious art Thou, O Christ our God, Who hast established our fathers as luminaries upon the earth, and hast thereby guided us all to the true Faith! O greatly Compassionate One, glory be to Thee! The Son Who ineffably shone forth from the Father hath been born in two natures of a woman, and beholding Him we do not disdain to depict the form thereof. But, tracing it piously, we honor it in faith. 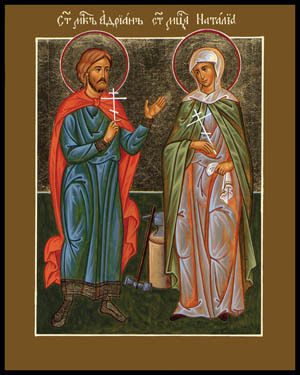 Wherefore, the Church, holding to the true Faith, doth venerate the icon of the incarnation of Christ. Ss. Peter & Paul Men’s Fellowship will take place on Tuesday, 6.00 pm at Seraphim’s house. No Adult Education Class this week. Thank you for your contribution to Tatsiana! 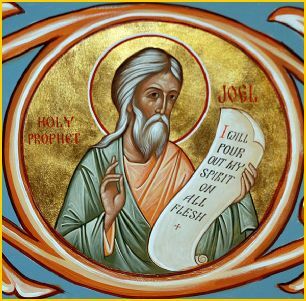 On October 19 we remember the Prophet Joel, who lived in the southern kingdom of Judah. Joel begins his prophecy by describing something that actually occurred—an invasion by hordes of locusts which overran the land. He writes: “What the cutting locust left, the swarming locust has eaten, and what the hopping locust left, the destroying locust has eaten” (1:4). Joel describes these invaders as charging warriors who march without swerving from their paths or jostling each other. They “leap upon the city, they run upon the walls, they climb up into the houses, they enter through the windows like a thief” (2: 7-10a). The effects of this attack are devastating. Writing in the first person, Joel describes the locusts as a “nation” that has come up against “my land” and with its fangs like those of a lioness it has “laid waste my vines, and splintered my fig trees; it has stripped off their bark and thrown it down; their branches are made white” (1: 7). Joel views this frightening, destructive event as a judgment from God. As one who must speak God’s word to the people, the prophet can only sorrowfully call on them to repent. He extends his call to the entire community, including the priests and “ministers of the Lord.” He emphasizes that all must repent because all are being harmed, including the animals: “How the beasts groan! The herds of cattle are perplexed because there is no pasture for them; even the flocks of sheep are dismayed” (1: 18). On the day of Pentecost, Peter quotes Joel’s prophecy that God will restore the land and that He will “pour out My spirit on all flesh; your sons and daughters shall prophesy, your old men shall dream dreams, and your young men shall see visions. Even upon the menservants and maidservants in those days I will pour out my spirit” (2: 28c-29). We have enjoyed reading your web site. Good work!. God bless you all. San Seraphim of Sarov Parish in Seville (Spain) Clergy. We have enjoyed reading your web site. Good job! From: The clergy of the Hispanic Orthodox Church in Spain.